Specialising in cars, small vans, large vans from Brighton to London Manchester, Leeds and Glasgow. 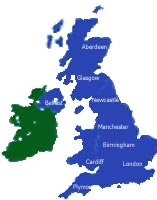 In fact Fastspeed Couriers offer same-day urgent delivery services from East Sussex to all parts of the UK so we can supply a Car / Small Van / Large Van to Birmingham , Glasgow , Leeds , Cardiff , Derby, Sheffield, Bristol , Nottingham , Leicester , Swansea or Plymouth etc. Get an instant price estimate by calling 0844 414 3910 for a fast, free quote. Fastspeed are the specialists in urgent Brighton courier jobs. As a part of the largest network of sameday national couriers in the UK we offer access to tens of thousands of vehicles, based all over the UK at strategic points. This gives us the the resources and flexibility to handle all of your urgent delivery needs. Our UK couriers collect from most major towns and cities across East Sussex and the UK within 30 - 60 minutes. No need to have an account as we can take payment through our online bank. Your payment will be processed by Nochex and is 100% secure. All deliveries will be carried ASAP with attention to individual customer requirements. We aim to provide all customers fully informed at all times about the progress of their delivey. After calling us for a quote we will send a confimation e-mail with the job details and an order number. You will then be able to make payment by credit card through our secure online banking system. After the delivery is completed we will inform you about the time of the delivery and who signed for it (the POD / proof of delivery). We will send you the appropriate tax invoice via e-mail to cover the job and payment and if necessary the hard copy POD can be sent to you. Our service is designed to respond to your specific business requirements and we aim to offer the cheapest quotes. So whether your item is urgent, a forgotten passport, key documents, luggage to a hotel, something highly confidential or just needs to be there at a certain time we can help! Two contacts have been awarded by Highways England worth around £2.8m. These are to install 50 electric vehicle charging points across the country over the next nine to ten months. Highways England's aim is ensure that at least 95% of it's major roads, including motorways, are within 20 miles of an electric vehicle charge point. A new next day tracked service from Parcelforce Worldwide has been launched called express24large. This service is for sending and receiving larger items. For parcels bought online, Parcelforce Worldwide will collect the parcel from a home or business address or if sending parcels they can be dropped off at a local depot. Parcels can be up to a generous 2.5 metres in length but the length and width combined should not exceed more than 5 metres. Although individual parcels can weigh up to 30kg, there is no weight limit for the full consignment of parcels. Customers can check their progress as every large parcel is fully tracked. Also large parcels can be sent direct to the recipient, or picked up from their local depot. Air pollution has been called a public health crisis by Transport for London (TfL). It rejected claims that Londons impending Ultra Low Emission Zone (ULEZ) wiold have little impact, which came from none other than the haulage sector. TfL director of city planning, Alex Williams said pollution was hitting the citys poorest the hardest.and leading to thousands of premature deaths each year, "After one year we expect harmful nitric oxide and nitrogen dioxide emissions in central London to reduce by 45%"
He said they also finalising a £23m van scrappage scheme, which will help small businesses replace their polluting vans with new cleaner ones. Parcelforce Worldwide have recently unveiled a new South East Processing Centre (SEPC) in Hatfield, The new centre, located on Hatfield Business Park is expected to create more than sixty new jobs in the local area. This will include drivers and warehouse operatives. This idea also should help reduce their carbon footprint, by processing parcels within the south-east rather than transporting them to a central hub. Sadiq Khan, the Mayor for London has the backing of ministers with plans that all lorries entering London will need a permit, issued by Transport for London before they can enter the capital. Ministers have applied to the European Commission for approval of the scheme, as EU hauliers will also need a permit to enter London. If and when the Commission gives the scheme the green light, from October 2020 all HGVs entering London will be assessed against the TfL-devised Direct Vision Standards and must obtain a permit from Transport for London. TfL had previously claimed that around half of the lorries entering London will need to be fitted with additional safety equipment such as camera systems, audible turn warnings and side sensors with driver alerts before a permit can be issued. Fines will be issued to operators of any lorry entering without a permit will faces fines of £550 , plus a personal fine for the driver of £150. The first phase is planned to run from October 2020 until 2024 at which time new standards, yet to be devised, will be mandated by TfL. Whilst the House of Commons prepares a vote on a motion on customs & borders (26 April 2018), the UKs logistics industry has been reminding MPs about forming a customs union with the EU would not deliver frictionless arrangements on its own or remove the need for checks at the borders. Leaving the single market should also be considered to minimise regulatory barriers, removing the need for conformity or food safety checks at the borders, and to protect transport connectivity after Brexit. The Port of Dover (the UKs busiest transport hub with continental Europe) has more than 10,000 HGVs travel coming through it and the Eurotunnel each day . This icludes the highly efficient roll-on roll-off system which reduces, to a bare minimum, the waiting time at the borders, This in itself supports the just-in-time production processes and time sensitive deliveries. Directly having an impact on over seven million people employed in the making, selling and moving of goods, efficient logistics is vital to keep Britain trading, . With Brexit, new technology and other disruptive forces driving change in the way goods move across borders logistics has never been more important to UK and it's business supply chain, . Northamptonshire Fire and Rescue Service rushed to the scene just before midnight on Sunday. A warehouse belonging to DHL the parcels giant, has been destroyed sparking fears of delivery chaos. More than 50 firefighters tackled 30ft-high flames at the industrial units in Drayton Fields Industrial Estate, Daventry, Northants. A man was arrested on suspicion of arson and has been released on bail pending further enquiries. Marigold Health Foods have selected a quiet, engineless refrigeration unit that reduces emissions and noise pollution. to cover urban deliveries across Greater London. The firms new DAF LF 18-tonne rigid has been fitted with The Carrier Transicold (UK) Iceland refrigeration system,which can run entirely on hydro-electric power. The trucks engine generates hydro-electric power and at even at idle speeds, is capable of providing 100% refrigeration. The new DAF marks an expansion to Marigolds seven-strong fleet. It meets the need for larger chilled multi-drop delivery vehicles by offering a 15-pallet load capacity and joins a fleet which is 100% Carrier-cooled. Managing director of highways at Morgan Sindall, Mr Paul Gott, said: 'These contracts mark the start of two more prestigious projects for bmJV. A two stage design and build contract worth £104m, will see bmJV upgrade 10 miles of the M62 between Warrington (J10) and Manchester (J12). The second contract, worth £218m, covers works on the M27 between junctions 4 and 11 to create permanent dual 4-lane all lane running along the 15-mile stretch. A 'pay per mile' scheme for lorries is being considered by the government to cover the increased damage to the road network. Chris Grayling, the Transport Secretary has confirmed the current HGV levy, which is used to pay for wear and tear on the road network, was being consulted on. The Road Haulage Association (RHA) have said they believe it unfair that lorries are targeted and need to see more detail. Mr Grayling also pointed out on BBC Radio 4's Today programme that "Our hauliers often complain that a continental trucker comes in with a tank full of lower duty diesel, spends several days working in the country, goes away again and pays nothing towards the use of the roads." A RHA spokeman said he was very worried by the announcement. As of 23rd October Mayor of London Sadiq Khan has launched the worlds toughest emission charge for the more polluting and older vehicles in an effort to tackle the capitals air pollution. From 7am to 6pm every weekday a £10 Toxicity Charge (T-Charge) will be in force. Drivers of more polluting petrol and diesel cars will pay both the T-Charge and the Congestion Charge when driving into Zone 1, which totals a colossal £21.50. This, according to the mayors office, means up to 34,000 vehicles every month could be liable for the T-Charge and affects those that do not meet the Euro 4 standard for both PM and NOx emissions. These vehicles are typically ones registered before 2006, but Transport for London (TfL) have also advised people who have cars registered before 2008 to check if their vehicle may be eligible for the charge. The Mayor Khan says he has plans for the introduction of an Ultra-Low Emission Zone as early as April 2019. This will affect many more vehicles including all diesel vehicles that do not meet Euro 6 Standards. Highways England have been contacted by the transport minister to suggest ways for clearing motorways of vehicles after closures. Highway chiefs have been told to further reduce closure times after accidents after figures have shown traffic jams on major roads across the UK are costing the economy as much as £9bn a year. The funding will pay to improve roads, improve journey times and hopefully cut congestion. It includes money from the new National Productivity Investment Fund, the Pothole Action Fund and £75 million. From this councils can bid for to maintain and repair the local infrastructure such as bridges, street lighting and even rural roads. Andrew Jones the Transport Minister pointed out roads play a significant part in everyday life linking businesses with customers and people with jobs. During the fourth quarter of the year, Royal Mails performance of 92.8 per cent meant it narrowly missed its target for First Class mail, but with a performance of 98.8 per cent, it exceeded its target for Second Class mail. Royal Mail is known for one of the highest Quality of Service specifications of any major country in Europe. With the largest fleet in the UK with well over 49,000 vehicles on the road, the Royal Mail has taken steps in managing it's carbon footprint by making sure all it's HGV's meet specific aerodynamic specifications. This has been found to reduce fuel consumption by an impressive 5 per cent. The Royal Mail purchased 300 Cartwright Cheetah Fastback Trailers and asking manufacturers to use a lighter weight trailer design. With over 100 members and accounting for over 77,000 commercial vehicles the Freight Transport Association, which runs the LCRS scheme, is a free voluntary initiative that records, reports and whose aim is to reduce the carbon emissions from freight transport. . This is an update on a story first published in 2008. French vineyard owners are starting to export their wine by sailing boat - a method last used in the 1800s - to reduce their carbon footprint. Later this month, as many as 60,000 bottles will be shipped from Languedoc to Ireland by sail, saving 18,375lb of carbon. Further voyages to Bristol, Manchester and even Canada are being planned for soon afterwards. The three masted ship, a barque named Belem, actually launched in 1896, will sail from Bordeaux to Dublin, which although it will take about four days, will be much more environmentally friendly. What is great about his is that each bottle will be labelled: 'Carried by sailing ship, a better deal for the planet.' Although the whole process takes up to a week longer than sending by air, it is estimated it will apparently save as much as 4.9oz of carbon per bottle.